When you eat your sweets, make sure you try to limit your servings or you'll die (break for yelling and screaming "DIE!!!"). Compared to some of the food and agriculture lobbies debating farm subsidies and food stamps, we were a small team working on small issues. But to many people, the local procurement victory [allowing school lunch programs to request locally grown foods from their suppliers] is a significant one. The ability of school food service directors to request local foods opens up great opportunities for local food systems. Schools can be important customers for small farmers. And schools that try to link local agriculture with their curricula have greater success when students can make a field trip to a local farm and then eat that farm’s apples (rather than ones shipped in from across the country) in the school cafeteria. Mind you, political theater can be entertaining. On the last day of debate, Republicans claimed to be surprised that part of the farm bill’s funding would come from a tax increase. The response from Charlie Rangel, Democrat of New York and chairman of the House’s taxwriting committee, was sarcastic. He reminded the critics that they had agreed to ask Rangel’s committee to find the additional money. “You didn’t go to the chairman of the Transportation Committee,” Rangel admonished them. But after the chuckles die down, we have to wonder whether the right questions were asked about farm policies themselves. The 700-page farm bill authorizes nearly every aspect of federal policy administered by the U.S. Department of Agriculture, from food stamps to conservation to farm subsidies to rural development, at a cost of about $286 billion over five years. It seems there should be more there to discuss than whether a funding source should be called a tax. The same week that residents of the Lower East Side and Chinatown gathered to protest the closing of a Pathmark store in their neighborhood, Mayor Bloomberg and Speaker Quinn proposed legislation to issue permits for "green carts" - which would offer fresh and processed fruits and vegetables from mobile food carts in designated neighborhoods with low fruit and vegetable consumption. With the goal of increasing fruit and vegetable consumption in these neigborhoods, the legislation would issue 500 permits each to the Bronx and Brooklyn, 250 to Queens and Manhattan and 50 to Staten Island- for the neighborhoods. 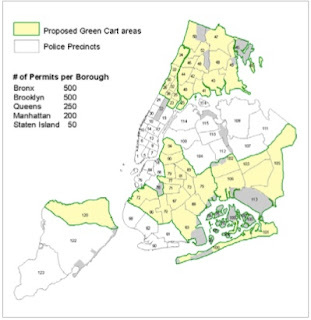 More information about the green carts is available on the NYC DOHMH website. a resident of Fort Greene told City Limits “We need a store where it has a variety of foods like canned goods and bread – a cart won't do. It’s a nice gesture,” said McDaniel-McCadney of the carts, but “it just wouldn't be sufficient for the community." Perhaps to promote this more systemic change in access -- a $175,000 grant from the Gerald J. and Dorothy R. Friedman Foundation-- the very Friedmans for whom the Tufts Friedman School is named-- to the Food Trust to work with the Food Bank for NYC and the grocery industry to improve access to fruits and vegetables in low-income neighborhoods with inadequate access. The Food Trust has a strong track record of strengthening development and renovation of supermarkets in Philadelphia in the past four years. Stuffed and Starved — a sweeping look at the development of the international food chain that delivers calories from nation to nation with an alarmingly uneven hand. As its title promises, the book tackles one of the chief dysfunctions of our unique era in alimentary history: that 800 million people are getting too little to eat and are malnourished, while over 1 billion are getting so much they've become overweight or obese. While playing with network sites recently (Linked in, Flickr, Facebook), I recalled a book by Duncan Watts in 2003: Six Degrees: The Science of a Connected Age. The book was written, paradoxically, just on the eve of the rise of all the network sites. Watts was a professor at Columbia, but recently moved to Yahoo!, to lead that company's research in "human social dynamics, including social networks and collaborative problem solving." More paradoxically, for a reflection on electronic networks and degrees of separation, Duncan and I were networked by just one degree of separation long before the invention of Facebook. Just the smelly-socks dirty-dishes pre-electronic old-fashioned networking technology: we shared a crowded house in grad school. Yesterday, Mark Frauenfelder at boingboing had a funny post about an incompetent fast food restaurant poster, with an incomprehensible offer of some sort of two-for-one deal at Checkers and Rally's. The related links section at the bottom referenced an earlier Frauenfelder post about Hershey's selling regular milk. I was walking down Van Nuys boulevard with my daughter, enjoying the 103 degree weather over the weekend, when she demanded milk. We went into a Burger King and I ordered a milk. When the employee handed me this bottle,... I told her I didn't want chocolate milk. She said it wasn't chocolate milk. I had to look at the ingredients to make sure. Three questions come to mind. 1) Why is Hershey's in the business of selling regular milk? 2) And why would it insist on making the label look chocolately? -- it would be like Lipton selling a bottle of water with pictures of tea leaves and a lemon on it. 3) And why Hershey's they make the label opaque so you can't tell at a glance if the milk is flavored or not? I don't think the Hershey's label is an accident. Milk manufacturers are purposely blurring the distinction between flavored milks with added sugar and regular milks. They want your mental filing system to file flavored milk in the "healthy" folder instead of the "sugary drinks" folder. Voluntary industry guidelines for marketing beverages in schools are written specifically to permit sweetened flavored milk, so long as the sugar content meets a certain standard. Barbara Vauthier's selective and tightly written Foodlinks America newsletter from the TEFAP Alliance now seems to be in blog format, with RSS feed and everything. Congressional Democrats and the White House ended a months-long impasse on federal spending on December 19, 2007 with passage of an omnibus appropriations bill for fiscal year 2008. The legislation combines 11 of the 12 spending bills Congress is required to approve each year to determine government outlays. “Given the President’s refusal to compromise and given the inability of the Senate to produce the 60 votes necessary to move legislation forward, this is the best we can do,” commented Representative David Obey (D-WI), chair of the House Appropriations Committee. With this final action, Congress exited town for the holidays, ending the first session of the 110th Congress. The House will be gone until January 15, 2008 and the Senate is now scheduled to reconvene on January 22, 2008. The huge $516 billion compromise package included an additional $11 billion over the President’s spending limit, with some of the funds designated as “emergency” needs that were not offset by cuts in other programs or new revenues. The legislation continued most nutrition assistance programs at current levels, though there were some notable exceptions. The WIC Program, beset by potential shortages from higher food costs, growing caseloads, and declining rebates, was allocated a full $6 billion for fiscal year 2008, an increase of $815.6 million ($400 million of which was designated as emergency spending) over last year. The $6 billion will help WIC maintain a national caseload of 8.55 million participants throughout the year. The omnibus measure also increased funding for the Commodity Supplemental Food Program (CSFP), which the Administration had proposed to eliminate entirely. The CSFP will receive $139.7 million in fiscal 2008, $32.5 million above the fiscal year 2007 appropriation. Other provisions of the bill: expand, effective immediately, the Simplified Summer Food Service Program to all states, easing paperwork and increasing reimbursements for sponsors; provide an additional $23 million for elderly nutrition programs this year; support a $10 million expansion in the 2008-2009 school year of the Fresh Fruit and Vegetable Program, making it available to all states; provide secure funding of $2.475 million annually to the Congressional Hunger Center’s Bill Emerson and Mickey Leland Hunger Fellowship Programs; and fund a Supper Pilot Program in West Virginia under the Child and Adult Care Food Program (CACFP). Though Democrats felt the bill could have been better, they expressed satisfaction with the final outcome. “While the President’s stubborn opposition will deny Americans the full investment they deserve in these priorities, the Democratic budget begins to reverse seven years of neglect and charts a new direction,” concluded House Speaker Nancy Pelosi (D-CA). In food policy class this Fall, I explained how eligibility for food stamps is determined: gross income below a certain threshold (130 percent of the poverty standard), net income below a certain threshold (100 percent of the poverty standard), an asset test ($2,000 or $3,000 asset limit), special rules if you already receive cash assistance or SSI or are disabled or elderly, and so forth. "Can that be right?," a student asked, upon hearing the part about the asset test. "I know for certain that there is no asset test in Massachusetts, at least not for families with children." Sure enough. In Massachusetts, families with a child under age 19 benefit from more lenient rules, including a more permissive income cutoff (200% of the poverty standard) and no asset test. Asset rules for the Food Stamp Program vary substantially from state to state. Good sources of information about the details of food stamp rules in Massachusetts include Massachusetts Legal Services and Project Bread, and good sources at the national level include the Center on Budget and Policy Priorities and the Food Research and Action Center. This request for a report to Congress (see page 15661) was apparently buried in the manager's amendment to the Senate Farm Bill. SEC. 49__. REPORT ON FEDERAL HUNGER PROGRAMS. (B) the number of farmers and other agricultural producers in the United States that receive some form of assistance from the Department. Congress can strengthen food assistance programs by calling for and funding high quality evaluation research with strong research designs, but simply asking for the results of independent reviews that one can easily verify have not been done would be a tactic for undermining the food assistance programs. What's the angle here? It is time for an introduction. For several months, my occasional collaborator on U.S. Food Policy has been Aliza R. Wasserman, a graduate student at the Friedman School of Nutrition Science and Policy at Tufts, whose studies focus on food policy and environmental health. You may have read her posts on the Senate Farm Bill and the Wansink appointment. Aliza also writes sometimes for The Jew and the Carrot, a blog about Jewish food and contemporary life. Welcome, Aliza. Speaking of Huckabee, Washington Post writer Liz Clarke fielded a question from me as the first item in her online discussion about the GOP candidate today at washingtonpost.com. Arlington, Mass. : In part because of his own experience with successful weight loss, Gov. Huckabee paid more attention than most governors do to food policy -- how public policy can support a healthy food environment, for example. This fall, we just suffered another disappointing reformless Farm Bill. Do you think Huckabee would be more likely than other candidates to support a new direction in food and farm policy? Liz Clarke: That's an interesting question. Let's start here. In my time speaking to Gov. Huckabee, reading his books and interview transcripts, this didn't come up. But from what I learned, I would guess that he would be more proactive than some others. Largely because of his own experience, having been diagnosed with Type II diabetes and warned that his lifestyle and eating habits were on the way to sending him to an early grave, he did become more pro-active about how public policy can help steer people to a healthier lifestyle. He favors a shift in health-care spending to preventive care. And has spoken about finding ways to reward people for healthy lifestyles--lifestyles, specifically, that will save taxpayers money in the long run. Former Arkansas Gov. Mike Huckabee (R) is the flavor of the day in the national news media. MSNBC this morning describes him as the closest thing the GOP has to a front runner now. For background, the Washington Post has a recent biographical feature, focusing largely on Huckabee's religion, and an account of Huckabee's successes in Iowa grassroots politics, which led in turn to his national surge in the GOP presidential race. [H]aving considered the relationship between personal responsibility and government regulation, I arrived at several conclusions, and these conclusions have guided my Healthy Arkansas Initiative. The second conclusion that's driven my health policy is the fact that, in America, people have the right to make choices that some might consider stupid. Americans jump bikes over buses, drive golf carts off cliffs, skateboard down stairs and bungee from bridges. While we can't regulate all behavior, we must promote wise choices in hopes of preventing expensive consequences for which we all have to pay. To help parents make wise choices for their children, in Arkansas we now measure each school child's Body Mass Index and send it home in a private health report. This report is not intended to be a diagnosis, but it is serving as a way to inform parents when their child may have a problem, whether it's too much weight or too little, and they are given information about local resources where help can be found. Again, we believe that, given the information, people will more often than not make the right choice. Third, our policies have been tempered by the understanding that Ronald McDonald is not Joe Camel. We have refused to make villains of the food industry for giving us what we demand. This means we have not attempted to regulate what people eat by advocating price controls and unhealthy options or by threatening restaurants with lawsuits. I know this puts me at odds with some of the more vocal public health crusaders, but I believe in the wisdom of the free market and we are already starting to see an evolution of the food industry as consumers begin to demand more healthy options. Fourth, we recognized an obligation to protect consumer and employee safety. If property rights were absolute, the state would have no business enforcing health codes in restaurants to protect our unsuspecting bodies from invaders like E.coli. Just as we find it acceptable to protect workers from asbestos, radiation exposure or loud noises, it seems reasonable that we would find it appropriate to protect them from exposure to the toxic fumes of secondhand smoke. Like personal liberty, property rights are tempered when the exercise of those rights puts others in harm's way. Finally, and this is a truly groundbreaking point, our policies have been driven by the belief that being well is better than being sick. Whether we are talking about our personal budgets or quality of life, it is more fun and less costly to be well. Agree or disagree, that's a longer record of thought and reflection about food policy than you will hear from most candidates. Comments are open. Both amendments--Lugar-Lautenberg's "Fresh Act" and Dorgan-Grassley's payment limits-- that would have included meaningful farm subsidy reform in the 2007 farm bill failed in the past two days, the latter falling only 4 votes short of the 60 it needed to be adopted. The Environmental Working Group and the Center for Rural Affairs blogs have some interesting analysis of how the Democrats sabotaged reform by playing politics with the vote's parliamentary procedure, in order to prevent Sen. Blanche Lincoln (D-AR) from embarrassing her own party. They place blame for the failure of Dorgan-Grassley squarely on the Democratic leadership and those reform-touting Senators who voted against the amendment. A number of other amendments to reform agriculture policy remain to be voted on, including Sen. Tester's (D-MT) attempt to "beef up" the new Livestock Title by adding a "packer ban" to check the power of industrial meatpackers and processors by reinforcing the Packers and Stockyards Act's rules against market manipulation. Apparently, the meat industry has been hard at work preventing this amendment from passing. You can watch here. Update 12/20/2007: fixed broken link. Given that a Republican sits in the Presidency, which has the power of the veto, it is not easy for the Democratic leadership in Congress to pass legislation. Hence, one of the main consequences of the return to Democratic Party leadership in the Congress is heightened oversight from the House Committee on Oversight and Government Reform, chaired by Rep. Henry Waxman (D-CA). The Federal Crop Insurance Program has become a textbook example of waste, fraud and abuse in Federal spending. Under this program, farmers received $10.5 billion over the last six years, but it has cost the taxpayers almost $19 billion to provide this financial protection to farmers. Over $8 billion in taxpayer funds have been used for excess payments to insurers and other middlemen. Somehow, about 40 cents of every dollar that the taxpayers have put into the crop insurance program has been for unproductive expenses. Here's the full explanation of the problem with crop insurance (.pdf), from the Government Accountability Office (GAO), the investigative arm of Congress. 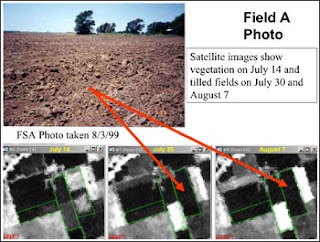 Here's an interesting image and article from NASA last year, showing how satellite images of farmland can be used to prevent crop insurance fraud. Eggbeater. A talented pastry chef in San Francisco. Recently served Al Gore, who cleaned every morsel from his plate. Michael Ruhlman. Chef and writer. Author of the well-received new book: The Elements of Cooking: Translating the Chef's Craft for Every Kitchen. The Food Whore. Very funny. Most entertaining of all the nominees. Word of Mouth. From Guardian Unlimited. U.S. Food Policy. "But is it really a food blog?" you might ask. What, haven't you tasted my bread machine bread or plum torte? Well, okay, it may not quite steal your vote away from that pastry chef in San Francisco! Voting is open until December 14. Xeni Jardin from boingboingtv today tries her hand at cloning meat, under the tutelage of a crew of artist/scientists. If you're interested in meat that is not so much cloned as merely processed nearly beyond the point of recognition, see another boingboing post recently from Cory Doctorow, which links to a particularly clever and usable web-based display of nutrition facts for hamburgers and other fast food offerings. The application comes from a calorie counter, which also allows easy searches of the USDA database of nutrition facts for other foods. Should FDA give waivers to panel members who have conflicts of interest? Two recent analyses offer opposing views about whether the Food and Drug Administration (FDA) should give waivers to outside experts, allowing them to participate on important government panels despite conflicts of interest. The Food and Drug Administration (FDA) relies on expert scientists as advisers on a host of panels, which strongly influence the agency's oversight of important issues ranging from food safety to the approval of new drugs and medical equipment. The advisers may have conflicts of interest, such as having received research funding from a company whose products are being reviewed by the panel. In some cases, FDA grants waivers to the rules prohibiting conflicts of interest, on grounds that the conflict is minor or that the adviser offers unique expertise that outweighs the concern about conflict. Last spring, the FDA proposed new rules that would limit such waivers. According to a summary from the Center for Science in the Public Interest (CSPI): "Those guidelines would ban anyone with greater than $50,000 a year in financial ties to industry from advisory committees and deny a vote to anyone with lesser conflicts." However, more recently FDA has emphasized the value it places on waivers, arguing that it would be difficult to replace the expertise of many advisers who have conflicts of interest. FDA cited a report (.pdf) from the Eastern Research Group, which reviewed a number of panels and argued that FDA might not be able to make do without the experts who received waivers (the report's first author, Nyssa Ackerley, is a former student of the food policy program here at the Friedman School). For each of the four advisory committees analyzed in the study, it would have taken a single FDA official just one week to replace all the advisers who had conflicts of interest with experts who do not have conflicts of interest, according to CSPI's analysis of the ERG data. Moreover, the FDA would be able to choose from nearly two potential unconflicted experts for every open slot. And, based on the same criteria for the expertise of potential committee members used in the study, these easily identifiable unconflicted experts would be more qualified than the ones eventually chosen, whether they had conflicts of interest or not. Do you think FDA should grant waivers to conflict of interest rules to recruit expert panelists who would otherwise be ineligible? Comments are open.